This is an interview I did with Felguk this week. They are playing at the Avalon for Control's 3 year Anniversary party tonight! Check them out if your in the LA area. 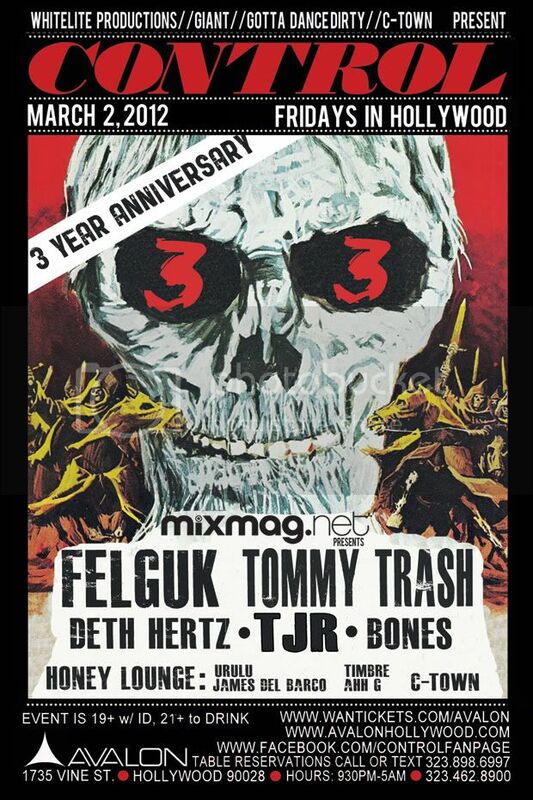 Tommy Trash will also be performing. We are EDM duo Felguk, from Rio de Janeiro Brasil. We've been on the scene for a little more then 4 years, rocking dancefloors around the world with pumping rocky massive-bass funky electro-house and its crossbreeds. Beatification: What motivated each of you to start making electronic music? Felguk: We both have been going to clubs and raves from a relatively early age. Added up with our passion for music and computers it was just a matter of time to start our own project. Beatification: What kind of equipment do you use when producing your music? Felguk: We use mostly soft sytths and use Cubase as our host sequencer. We do have a Moog Little Phatty, and a virus TI though, but we find ourselves hardly using them these days. We have build a room acoustic treated, and use Adam Audio monitors, with sub. Beatification: Who are some of your major influences? Felguk: Justice, Wolfgang Gartner, and now we are getting pretty influenced by artists like Knife Party that produce what we understand as a dubstep and electro crossbreed. Beatification: What is one of your favorite songs right now? Beatification: A lot of fans may say you have a "signature sound", do you feel this is true? If so how would you describe this sound? Felguk: I think it is true, and that makes us happy. I would describe as a pumping rocky funky melodic electro. Beatification: I've heard some previews for your new remix with Dirty South and Thomas Gold called "Eyes Wide Open" and it sounds like a massive banger, when will the full version be coming out? Felguk: It was released today (March the 2nd) on Beatport! We are very proud of that one. Beatification: Do you have any other new projects or songs to look out for? Felguk: Yes, we have a new collaboration with Infected Mushroom called 'I Shine' that will be out on their album soon, and we are going to put out a bootleg made in collaboration with Tim Healey that is going to be given away for free download pretty soon too. Beatification: How would you compare the music scene in Brazil to the music scene in the United States? Felguk: They are both big scenes with a very energetic crowd. But id say Brasil is more housy, and USA is more opened to various genres. Beatification: What have been some of your all time favorite venues to play around the world? Felguk: EDC LA/Vegas, Avalon, Anzu Club, Green Valley and XXXperience. Beatification: You have two shows coming up, one tomorrow night at the Yost Theater, and the Control 3 year anniversary on Friday night. Are these shows going to be the start of your US tour? Felguk: Yes. The show at Yost yesterday was a very good start to our tour: packed and intense! We are really looking forward to the Control anniversary today at Avalon, we have played a couple of times there and it is one of our favorite venues and parties ever. Beatification: I heard you will be touring with Benny Benassi in the UK next month, how did that tour come about and are you excited about it? Felguk: This idea came to the table when Benny requested our track 'Jack It" to put out in a compilation that he was arranging. We are very excited for that, since it will be our first time in the UK, peaking with a Ministry Of Sound show Saturday April the 7th. Beatification: What would you say has been your greatest accomplishment as Felguk? Felguk: Just to be able to live out of music! Thats a privilege! Do you have any advice for young producers just starting out? Felguk: Your production quality must meet the standards of the industry, but your creativity has to go beyond the standards of the industry. Beatification: Is there anything else you would like to say to your fans? Felguk: You guys are the real motor of the whole EDM circus! Lets keep rocking, and keep the party going! Beyond Wonderland Photo Contest Winners!